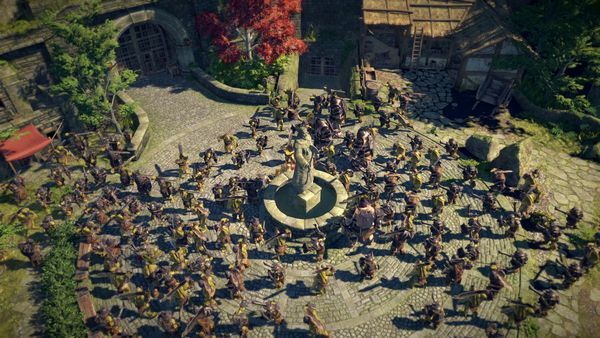 Already veterans of two successful Kickstarter campaigns, developers KING Art have today announced the launch of their next project, a Kickstarter for mass battle action RPG The Dwarves. Based on a five volume series of novels (Die Zwerge in their original German) by author Markus Heitz, The Dwarves is aiming to be a story driven RPG that follows dwarf-raised-among-humans Tungdil as he seeks to rediscover his heritage, gather an ever growing band of supporters, and fight back hordes of orcs. Indeed, fighting hordes is promised to be the core gameplay mechanic – KING Art emphasising how physics will play a part in using environments to your advantage, enemies jostling for positions (and more importantly, getting knocked into each other) and generally causing what they describe as “physical chaos”. The teaser trailer (linked above) places emphasis on showing large groups getting engaged and knocked around. While based on an existing series, KING Art claim permission from Heitz to change elements of the narrative for the game, and that Heitz in turn has contributed to some of the additional quests the game will offer. Mostly though, they are wanting to place attention on what they see as one of the most neglected fantasy races, and to bring players “more beer, beards and battle”. If successfully funded, The Dwarves is planned for release on PC, Xbox One and PS4 in 2016. Seven Dragon Saga – return of the RPG gold (box) standard?